Two-floor detached brick office unit available in courtyard business centre in Coleshill commercial quarter in Birmingham conurbation. Set amongst group of similar premises, this property (originally 2 units) benefits from a dual-pitched tiled roof, central reception area and first floor corridor and can be occupied as a single or separate spaces. Well-connected suburban location 1 mile north of Coleshill town centre, 2 miles to extensive motorway networks including M6 J4, M42 J9 and M6 Toll Road, 4.5 miles from Birmingham Airport, rail stations and NEC. 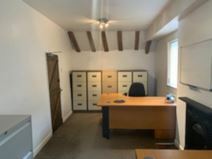 This is an elegant listed Georgian building that has been recently refurbished to offer impressive office space with charming period features and an abundance of light. A range of business facilities is available, and the centre is extremely accessible via a number of nearby roads and public transport links. 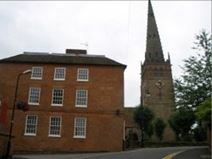 This office space is located in a Grade II listed building, situated on the High Street of Coleshill. There are two office suites available, one is 103 Sq Ft and the other is 163 Sq Ft. The building has many great facilities, including a large garden for use in summer months, toilets on each floor and a large on-site car park. The building has retained many of the original features. The train station is in close proximity to the work space. This building comprises a self contained head quarters within an attractive courtyard development and overlooks the beautiful St Philips Church. It incorporates many original features whilst providing air conditioning and modern IT and telecom facilities. Set in the heart of Coleshill near Birmingham, the offices are close to the M42 and M6 motorways and 10 minutes’ drive from Birmingham airport. The high street is just a short walk away offering an abundance of shops and cafés.